We went along to watch the Fightin’ Texas Aggies BTHO t.u. Having never watched Ice Hockey before, I was surprised at the face pace of the game and how violent it could be. The atmosphere became tense as the University of Texas scored the first goal. However, the Aggies hit back equalising and then going onto score another goal accompanied by Power by Kanye West (the official goal song) blasting out of every speaker . At end of the first period, the Aggies were up and the entertainment began. 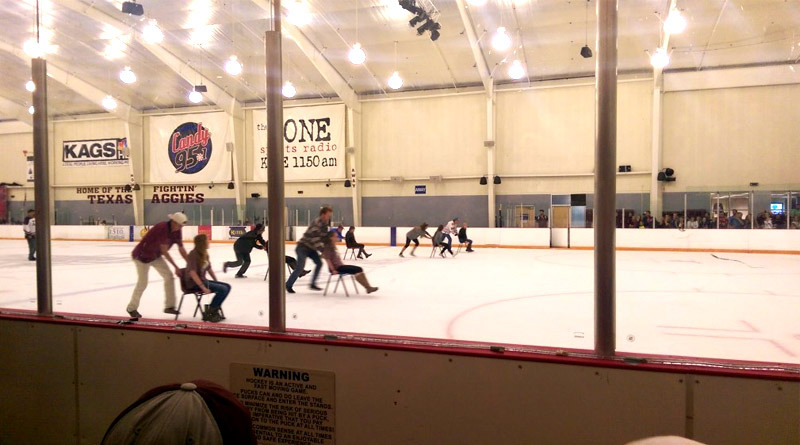 There was a race on the ice to see who could push a chair the fastest up and down the ice with normal shoes which, as you can imagine, was very funny. After the break, we saw the best player from the other team get sent off for attempting to claw at someones face, along with some more face paced action resulting in a couple more goals. The second break entailed the opportunity to win money if you could through a puck into a bucket on the ice. As the Zamboni prepared the ice for the last period, there was a loud surge in chants of support. The Aggies defended well in the last period and as their opening game ended, the Aggies were up 5 – 1. When the final bell rang, there was a ringing cheer followed by a round of the War Hymn being appropriately sung. Varisty’s horns had definitely been sawn off.